The best thing to do when you are deciding how to improve a living room is to determine were the focal point is. In this small living room, it was the tv, which originally was in the corner which didn’t provide adequate viewing space. 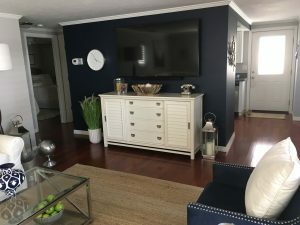 TV’s are better space savers mounted on walls, so we mounted it to the living room far wall and accented just this wall with a dramatic navy paint color. This color contrasted dramatically with the existing white console below the TV. Because the ceilings were mid-century modern low, we removed the ceiling fan and replaced it with a smaller floor fan. To create more visual space we chose glass tops for both coffee table and accent table. Glass tops reflect light and virtually disappear. 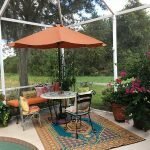 We added a decorative round mirror bringing in light from opposite windows, and placed a large lighter hemp rug to offset the dark wood floors. 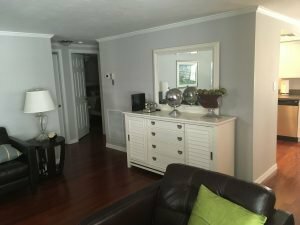 All these tricks created the illusion of space in a small living room and provided much needed additional and comfortable seating. 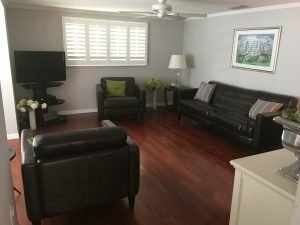 The brown leather furniture was inherited by our beach side client who was happy to see it replaced with a casual slipcovered sectional and lots of easy throw pillows. We selected new navy accent chairs with silver nail-head trim to coordinate with the silver metal trimmed coffee table. We know that lighting is key so we balanced each side of the room with lamps. We also balanced the standing lamp height by adding a tall faux palm plant in the opposite corner of the room. Finishing touches of personalized computer enhanced family photos, new artwork and table top accessories completed the room. 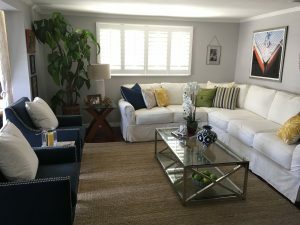 The end result is a clean beachy casual yet modern look which our client is thrilled with!